Dog Fleas In Your House? How to Get Rid of Fleas for Good! You've found fleas in the house and now all you're concerned about is getting rid of them! Alas, simply killing adult fleas is not enough. Discover 3 easy steps to banishing dog fleas from your home permanently. You've found dog fleas in the house! The first step is....to not panic. Chances are, your Cocker Spaniel has brought these pesky little parasites into your home so your first priority will be to treat your dog for fleas as he's likely the source of the fleas in the house. 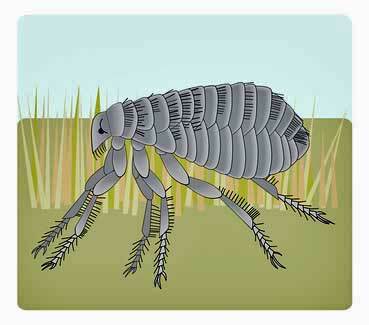 By the way, did you know that adult fleas represent only 5% of the flea population? The remaining 95% will be in your home (and on your dog) in the form of eggs, larvae or pupa, so simply killing fleas isn't enough because there are several stages to their life cycle. Once you've treated your Cocker Spaniel, your priority will be to kill fleas living in your home. especially if you don't know where to begin!" It's important that you vacuum your floors, carpets, and soft furnishings every day until you're confident that the adult flea infestation has been removed. You certainly won't remove them all in one day because the eggs, pupa and larvae are all developing at different rates. Each day you vacuum you'll be able to pick up those that have hatched overnight until you've eliminated them all. Make sure you get into all the nooks and crannies and don't forget sofa cushions and the edges and underside of your furniture. Pay extra attention to areas where your dog likes to lie, sleep or play. If your vacuum cleaner has a bag, throw the bag away after use as any eggs collected may hatch inside the bag and escape, resulting in a never-ending flea infestation: you'll never get rid of fleas in your house! Place the used vacuum bag in a bin liner, seal it, and then bin it. Now you need to spray the rest of your home to kill any remaining dog fleas and prevent eggs, larvae and pupa developing any further. Choose products that will kill fleas, eggs and larvae, but won't harm children or pets and always follow instructions on the packaging. Your vet will be able to recommend a treatment safe for use in the home. Treat your carpets and floors, paying particular attention to cracks between floorboards, skirting boards, and just underneath the outer edges of your furniture. If you've used a pet carrier recently, don't forget to spray that too, and remember to spray those areas your dog likes to play and rest. It's essential that you wash your dog's bedding regularly to remove any adult fleas, eggs, and flea debris. I recommend you do this before using a flea control treatment, that way you get a 'double whammy'! You may also like to check your own bedding. Not a nice thought, is it? However, it's possible that fleas have been carried into your bed, especially if your dog sleeps with you. If you have flea bites on your legs and feet, then there's a distinct possibility that you're sharing your bed with unwanted guests! Even after treating your home and your pet you'll probably still notice a few fleas on your Cocker and around your home. This is because the eggs and larvae will continue to develop and hatch (unless you've used a flea control which halts further development). That's why it's especially important to continue to vacuum carpets and soft furnishings regularly and to groom your Cocker Spaniel more often than you would normally. This may sound like a bit too much work, but let's face it, do you really like the idea of fleas in house?